If you would like to be informed about important news, you may subscribe to our newsletter. the only News that matters... updated several times a day! Only the most important news gets posted here. As always, you may find more and detailed News and gossip in the KISS Forum. Check out these 2 huge promotional billboard posters for radio station 88.6 in Vienna. Kiss are on the front-cover of the Italian magazine "Classix" (April/May 2019). Kiss My Kollectibles Podcast: Ace Frehley Record Store Day 2019 Release And A New KISS My Kollectibles Co-Host!!! Gene is on the front-cover of the Belgian magazine "Rock Tribune" (April 2019). Kiss are on the front-cover of the UK edition of "Classic Rock" (May 2019). ... that there is a mispressed version of the Portugese "I was made for lovin' you" single, where the song is printed on side 2? It is currently listed on eBay. KISS NEWS is a private inofficial website from KISS fans for KISS fans and is not authorized or supported by KISS, their management or record company. All news should be considered as unconfirmed unless stated otherwise. If possible, the source of the contribution of the news is indicated. We are not responsible for the content of pages we are linking to. Readers may judge the validity of information themselves. If using any scans/information from this site please give credit to where the info came from. 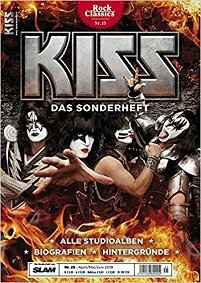 webmasters of other language-editions of KISS NEWS are indicated on the appropriate sites. Please send suggestions for improvement and reports of error messages to the webmaster. This Website is optimized for Microsoft Internet Explorer.